For the faluda layer, wash and soak the china grass in water for 10 minutes. Then drain the excess water and grind the china grass to a fine paste. Boil milk in a pan and bring to a boil, reduce the heat and cook till the quantity of milk reduces to 3/4th it volume. Meanwhile cook china grass with 3/4th cup of water in another pan till it completely dissolves. Then add sugar to this and mix well. Remove from flame and add milk. Mix well and pour the liquid into one small squat glass. To make the jelly, boil water in a pan and remove from flame. Add the jelly mix to this and stir till it dissolves completely. Now pour this into 2 squat glasses such that each glass is quarter full. Allow both the faluda and jelly to set for a few hours. Once set, use a knife to run over the edges of the glass and carefully remove the faluda on a plate. Cut it into 4 pieces. 2 piece for each glass. Now for assembling, take 2 glasses and add ¼ cup of chopped mangoes to each glass. 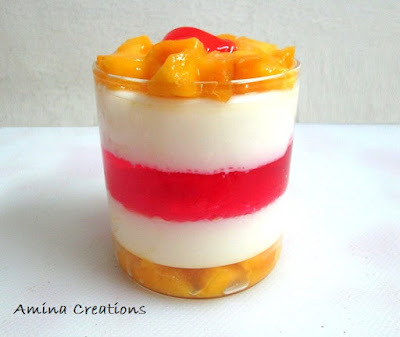 Carefully place one faluda piece over the mango layer in each glass. Now run a knife through the glass containing the jelly and carefully invert the glass over the assembling glass. The jelly layer will slowly fall over the faluda layer. Do the same thing with the other glass as well. Now we have assembled mangoes, a layer of faluda and jelly in each glass. Carefully add another faluda layer to both the glasses and decorate with the remaining mangoes on top. Refrigerate the 2 glasses for 2 to 3 hours and your mango, faluda and jelly surprise is ready to be served.